Myself and Paul are alternating games and last Thursday was Saga's turn. I decided to try one of the boards from the Raven's Shadow supplement, and rolled out the Viking-variant force, the Norse Gaels. I'd only played the Gaels once before, but recall their main abilities revolved around the use of Challenges, and these could prove deadly. Paul had his Anglo Danish, who are a tricky proposition in terms of toughness, but not hugely mobile. We rolled for scenario and got the duel, where both warlords start within spitting distance and are in for a slog to the death. Here we see them eying each other up with D12's for life point counters. Whilst above it is apparent how far away their allies would be. Now we both realised there would be issues with this match up. 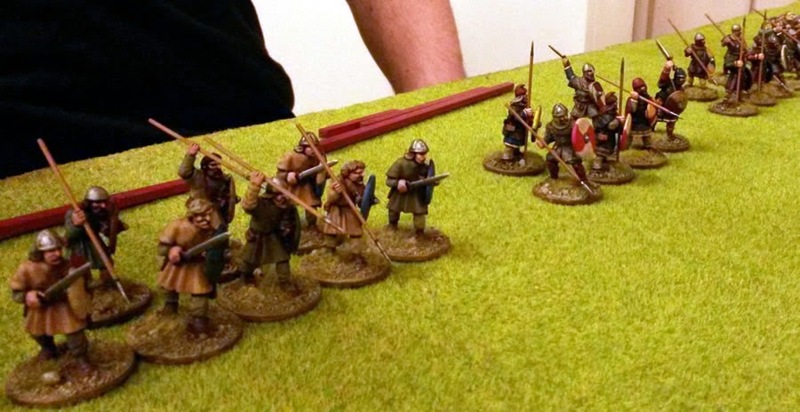 Paul is a regular on the forums and already knew that the Norse Gaels were broken (to use the parlance) for this scenario; on re-reading the challenge rules and the Warlord rules I picked up the situation pretty fast. And there you go. Whomp. After a turn of grace, we realised it was simply procrastination to carry on, Paul blinked first and charged, scratching me in combat. Battle joined I got a challenge ready and in the ensuing roll off I sixed him for an 11-0 victory, before any other warriors so much as swung a sword. It was a hollow victory really. Given it took all of fifteen minutes it seemed only fair to reset and change scenarios. We opted for the default Warlord battle; similar, but permitting our lords to start in the battleline. Indeed this is what Paul's Anglo Danes should excel at, and to that end he did form a tight shieldwall at the back of the board. 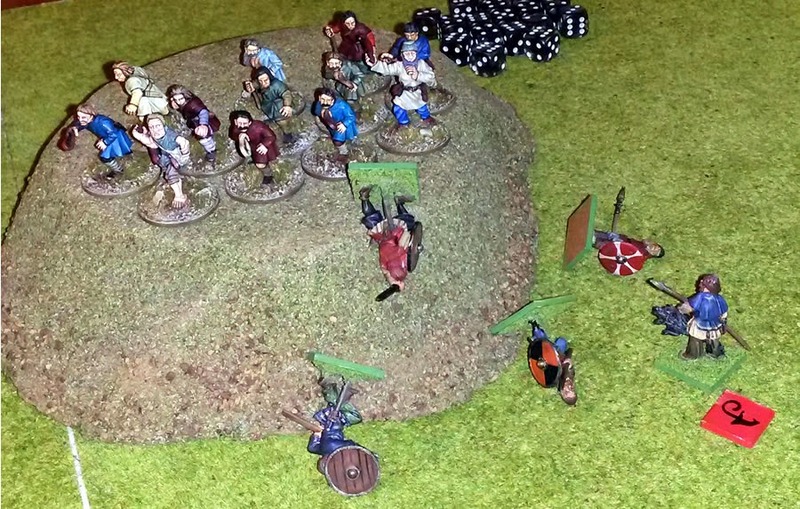 The Norse Gaels came on hard this time, but suffered some terrible early luck when a unit of warriors charged slingers on a rocky outcrop. This unit, this god-damned unit is rapidly becoming my bogey foe. Recently in an unrecorded battle they drove off two cavalry charges in a similar circumstances. This time they all but wiped out my warriors, winning the challenge and then thrashing us after a lacklustre melee round on the Gaels part. Led by the wargames worlds ugliest man (see picture) they are a peasant force to be reckoned with. But the rest of the battle was going better. Our heavy warriors tore through the enemy ranks, and along with my warlord were taking a heavy toll. But the numbers were no to stack up; at the end of the battle neither warlord had fallen, but there were more Danish dead than Norse, but more of the Norse were high value warriors. Paul's slingers had gone on to pick off a more lightly armoured unit of axemen and with the small number of hand to hand casualties it still resulted in a narrow points win for Paul. So after a couple of hours, honour was restored. Personally I like the Norse Gael list. Like a lot of the supplement lists they are trickier to use well, but as a result more fun to play. Just don't expect to get any satisfaction from a duel! 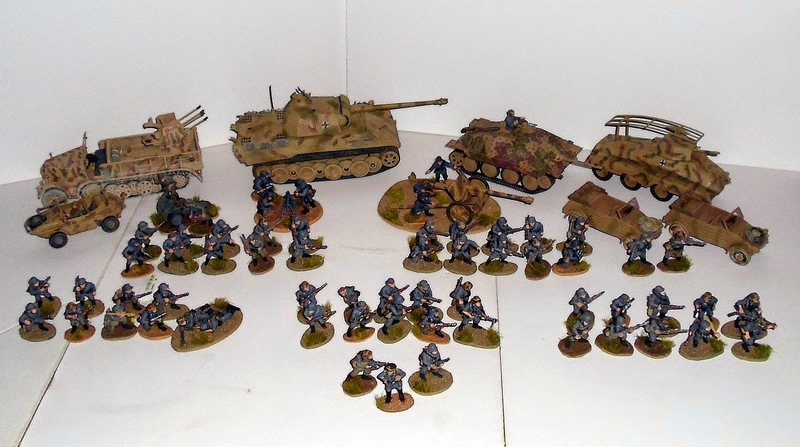 As alluded to I'm selling my 28mm WW2 to make room for more new models, relating more to current interests. I figure my space being limited, my painting time and gaming time similarly compromised, why clutter them up with items out of favour. Pleasingly the Germans are already up to £200 and certainly going to sell. So I had a rummage about in the loft for some models I knew would enjoy a second chance in life. 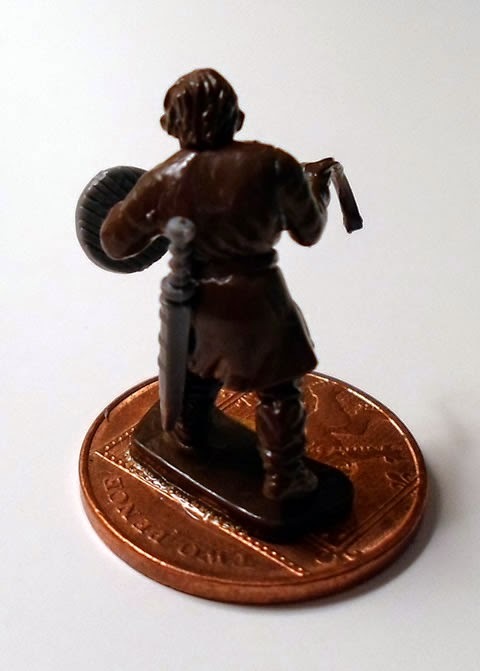 I'd been donated a couple of dozen medieval's some years back, but most were either broken, cannibalised or mutilated with enamel paint; and tiny to boot. 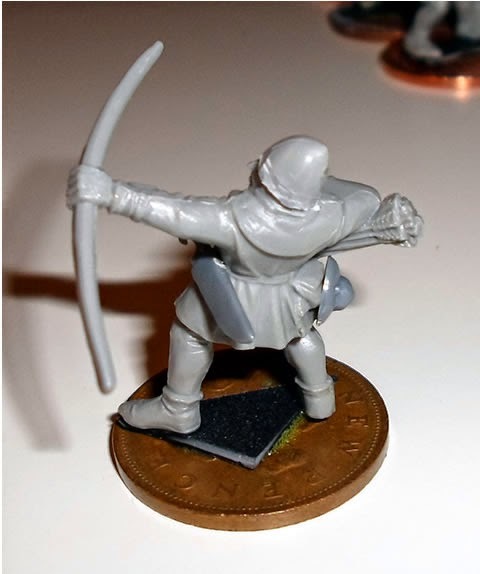 But amongst them were about ten of the classic Perry Bretonnian archer models (there is probably some unwritten rule about mandatory ownership of a handful of the Perry models by all Wargamers, I imagine). 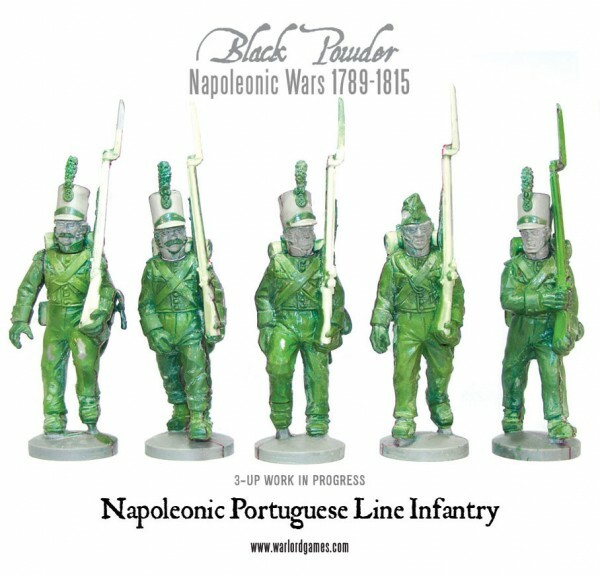 These will make an ideal bidower unit for my envisaged force. I see these gentlemen as Welsh or Borders bowmen. I added a couple of oddments from the spares pile and did a bit of trimming and reposing to the leader. It would've been nice to Greenstuff some hoods instead of helmets, but in my last move I appear to have lost a metre of the stuff. Back to eBay plumbing spares it is then. 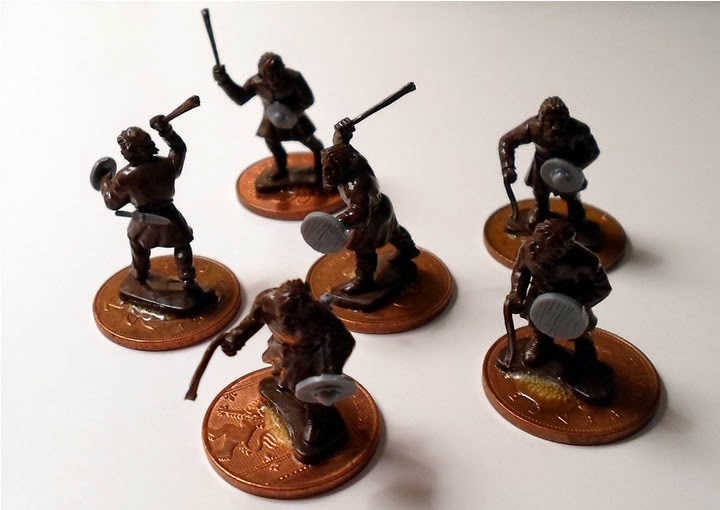 Additionally some spare Gripping Beast Dark Ages infantry made for some slingers. Records for the period I'm looking at show that slingers were still used for skirmishing, with contingents being raised from Nottingham Forest (not the football team mind, and presumably not Robin Hood's merry men either). 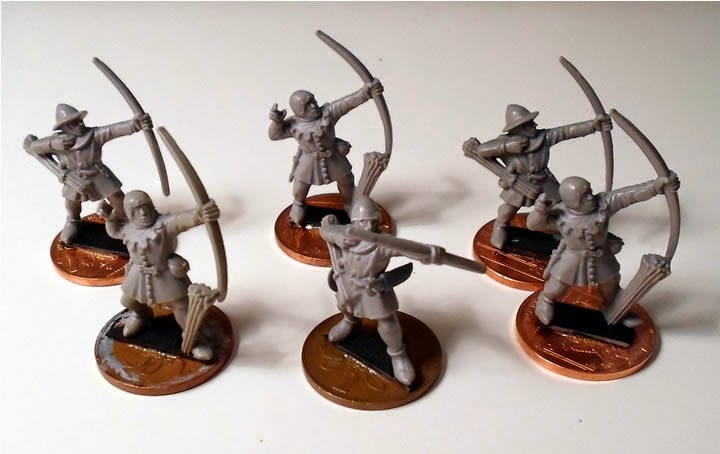 I don't expect to get to painting these guys just yet, and it is more likely the rest of the their retinue will arrive in the post first and supplant them in terms of immediacy and coolness. Still it is progress on my first 'New' project in two years. In other news, I got to see American Sniper over the weekend (at the GF's behest no less, either she likes war movies or Bradley Cooper/men in uniform, either way a woman of taste). I can certainly see why it has been hugely popular in the States, it's certainly patriotic stuff. The battle sequences leave the Iraqi's as largely unsympathetic characters, and mostly quite one-dimensional. The set pieces are impressive, but it is the quietness within it that is most affecting, the difficult times at home where combat stress is clear, the tension of facing the realities of who and where the enemy can be. Overall a good film, but not a great one to my mind. Not one that would encourage me to start wargaming the 21st century (see very old posts for that), but worth seeing for insight on he realities of the conflict and its' sad outcome(s). So yes, I find I'm still wanting to sell stuff on. 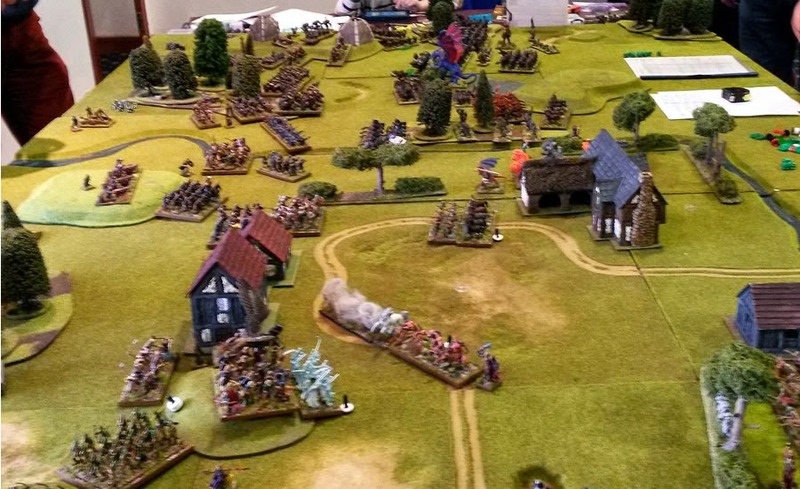 It's one of the common experiences of wargaming I think, passing fads and fancies, moving with the fashions, so on and so on. If wargamers weren't so fickle though the sellers wouldn't make a living. This time it's my 28mm WW2 collection that has finally become yesterdays fashion. I have a number of issues with these models which make it easier to move them on; given the vehicles are 1/48th scale, and the uniform colours are not always bang on. But mainly it is just that armies are not ones I have any urge to use any more. 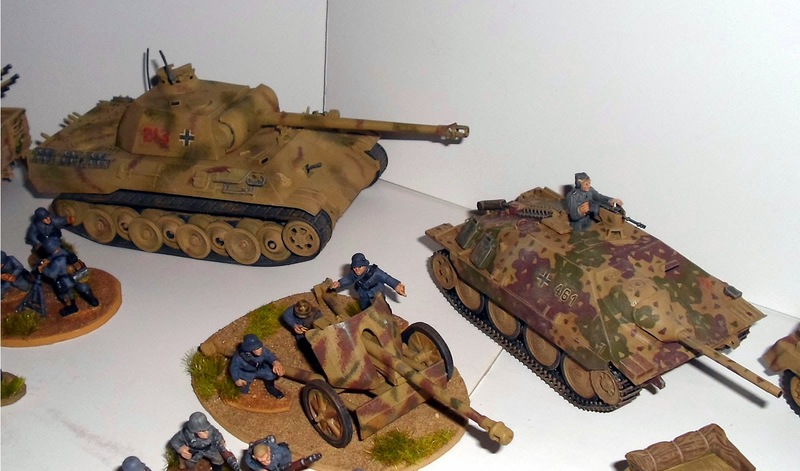 I'm still keen on the period, but locally at least the popular rules for 28mm WW2 are Bolt Action, which I really felt were seriously flawed (to the point of being almost unplayable - is it just me or is the Pin mechanic completely broken); so no encouragement there. 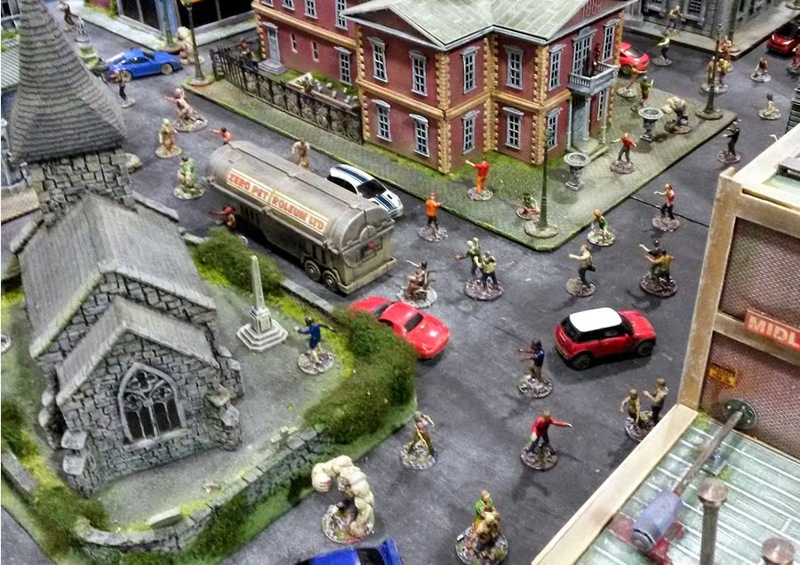 I don't have the space for 28mm scaled games with tanks on the board, whatever the rules it looks like 40k on a 6x4 foot table, problems that go away in 20mm, and more so in smaller scales. It makes room for other things of course - space is always at a premium - and the personal newness is Napoleonics and Medievals, not tanks and things. And so: You can click this link for the ebay sale. I will be happy to see them go to a good home, here's hoping I at least see them on someone else's blog one day. 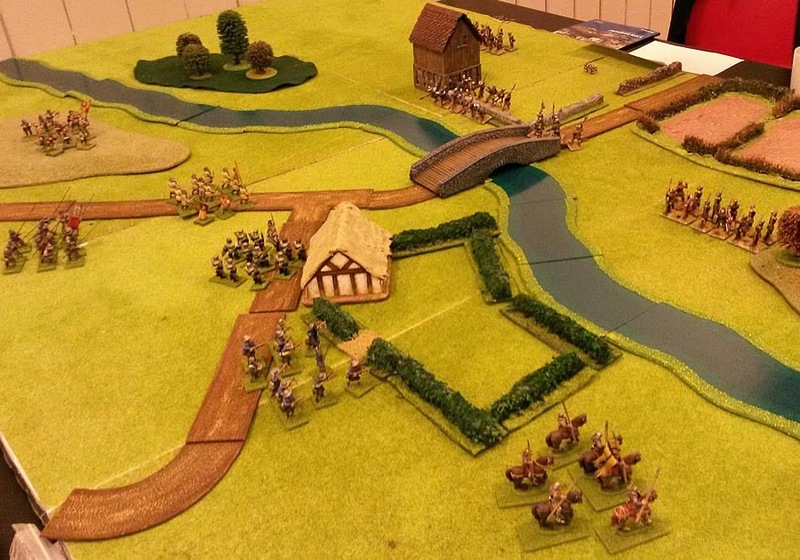 Myself and Paul broke our run of Saga games with our first try of Lion Rampant, a set of rules I bought a couple of months ago and, thanks to rave reviews, had been itching to try. Now Paul has an English army of the Hundred Years War (based for Warhammer Ancients and its' successors), whilst I have a large collection of the same period - featured on he blog plenty of times before - so from that I selected my favourite Flemish troops and we set about learning the game. To keep things simple we used the default scenario from the 12 available in the rules, Bloodbath. A simple 'beat the other chap up without getting beaten up' battle. Our two armies arrayed to the field with little idea of how things would work out, and slowly advanced on one another. Lion Rampant generates basic armies of 24 points, with most units having fairly similar points, All of mine were four point units and so I could field six of them, whilst Paul's more elite force came in at six points per unit. We each had two misslry units, whilst the English had foot knights and heavy infantry to my lighter infantry and mounted sergeants. The style of the rules is such that units are of either 6 or 12 men, again leaning to simplicity. The core mechanics of the rules are pretty simple, and revolve around the activation stats for different units actions. These include Attack, which Men at Arms are very good at, Movement, Shooting, suited to Bowmen and so on. This is very like Hail Caesar, in that you roll two D6 to get equal to or over said value. Fail a roll and your turn ends, so it is important to determine the order of your actions. As our forces closed the first opportunity for any aggression fell to me, and my Flemish crossbowmen were able to open fire on Paul's Men at Arms - which included his leader. 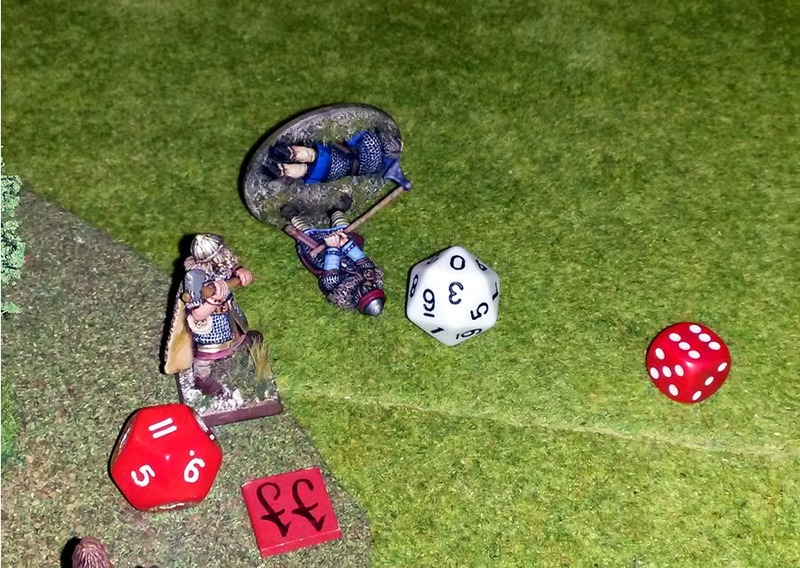 Now shooting and combat work in roughly similar ways, you have a target to hit roll and a set number of dice to throw - 12 dice for units over half strength, 6 if under half; the number of dice equating to the units starting size. One thing in the rules that seems odd is that the number of dice don't change much due to casualties, but this keeps both sides in the game and certainly suits the casual style of the rules. So the Flemings let fly, and hit one of the English square in the side of the head; you total the hits you roll and divide by the armour of the target the result is the number of casualties rounded down - I had 7 hits and Paul had armour of 4, plus one for the intervening hedgerow, for a total of 5 thus generating 1 casualty. Don't worry, there aren't any crossbowmen around...URGH! Alas he did not. 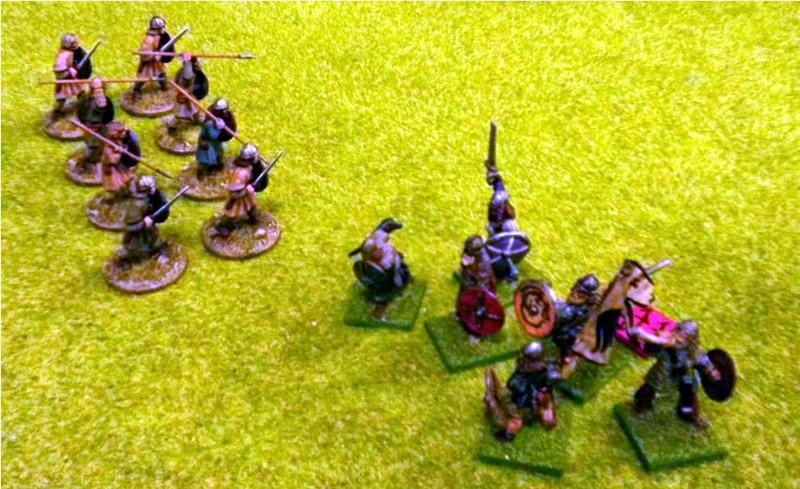 This led to a panicked leadership test for his whole army, and one of the English longbow units immediately fled. Already things were coming undone for the English. Morale is well handled, with casualties affecting the outcome and a fluid mechanic to allow for varying results. Troops who fail a test but have a result above zero become Battered (much like shaken in HC), end up with a roll below zero and you're off. Having set to his leader and cleared one flank more by good luck than anything I raced my cavalry to Paul's rear and tried to turn the other flank. A solid mass of Sergeants in the centre awaited his Billmen, who floundered across the river. Concerned that if he got the drop on me I would come off worse I formed Schiltron with my men. This is the only solid formation in the game and whilst static, increases ones armour. But it turned out that his troops were not up to the task so I sent my men in. Note that you can only ever sen one unit in at a time - much like Saga. This did not end well for Paul. But then elsewhere it was also going badly. 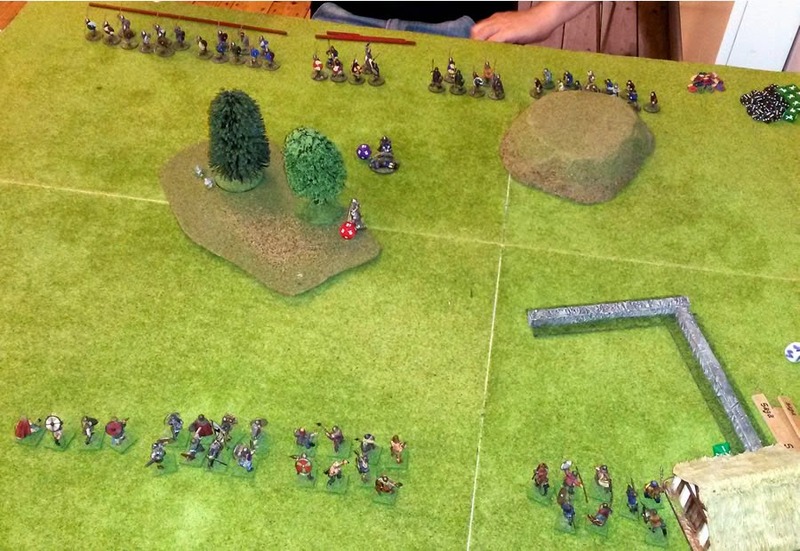 My mounted men, with my leader attached, ran down the last of the longbowmen, and then faced the Men at Arms, who had lost another man to my crossbows. The fight was swift and bloody, and resulted in both units needing a morale test; both failed and my only significant loss of the game was my leader departing the field nursing a bloodied shoulder. I tested for my troops and although a couple decided to retire, none fled the field. 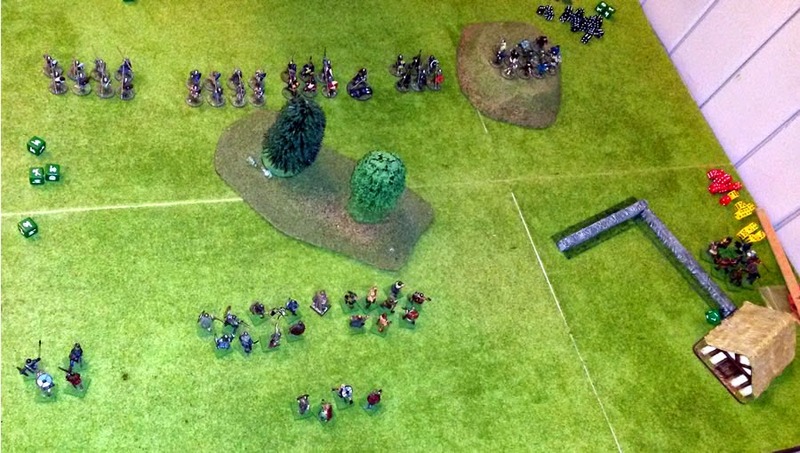 The last of Paul's troops quit the field and the game was at an end. Victory or defeat is based on Glory Points, and barring the one-sided nature of this battle should not be a clear cut affair. The scenario will have its' own victory conditions, but then each player may also choose boasts of value from one to three points - for example 'I shall destroy mine enemies' or 'I shall run rings around you'. Achieve a boast and you score its' difficulty points, fail to and it's minus one my friend! As it turned out with his lord killed, Paul could not complete any of his boasts, whilst I completed all my more modest claims. So the end of the game saw me win 9 points to nothing. So it was a glorious victory; but is Lion Rampant a good game. Based on this one run through so far I must say, HELL YES! 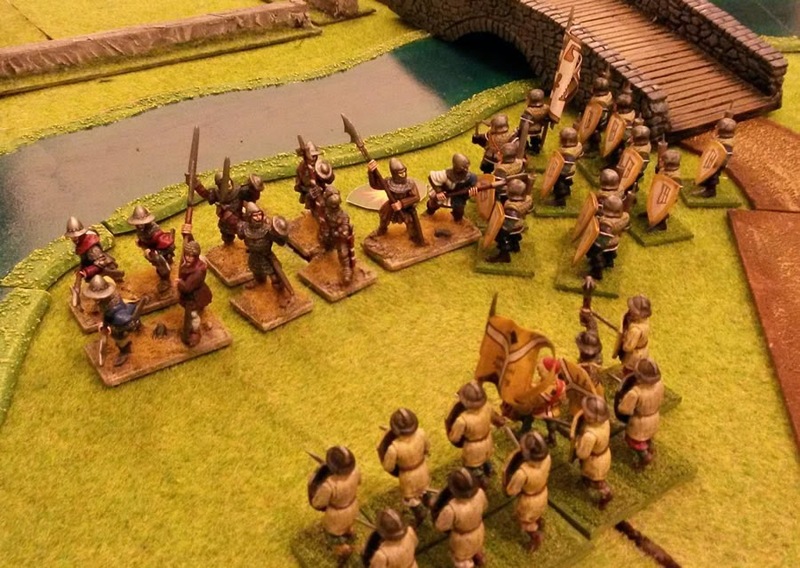 Lion Rampant is a fantastic game, with a real old-school flavour balanced by modern mechanics that mean you can't have it your way all the time and winning the game is not dependent on tweaking your army list to the 'nth degree. The rules cover both the historical - from around 1000-1450AD, the quasi-historical (Robin Hood, Arthurian myth and so on) and old-school fantasy (think pre Games Workshop styled armies). They are pitched to fun and fast play, but with enough complexity to keep you thinking. The typical armies are 40-60 figures strong and whilst it recommends singly based, so long as you have a few individuals to swap out casualties, multiply based figures are not a big issue; it plays an awful lot like a lightweight,miniaturised version of Hail Caesar - and this in my mind could not be a greater endorsement. Add to that the clever morale system and victor mechanics and you really are onto a winner. As to the production values; the rules are a visual feast, and clearly written too. This is my first encounter with the Osprey Wargames series and I am very impressed. I can't wait to play more of this, and am already planning new armies specifically with it in mind; a sure sign it has hit the mark. Two posts in one day, I must be getting back into this blogging lark. I've played a couple of the versions of C&C in the past and it is a great system - indeed I own one, but until the models are all painted I doubt it'll see the light of day - and it comes as no surprise that the game has already funded. OK so I chanced upon this one, and other blogs got there first, But on their Facebook page Gripping Beast responded to a comment confirming plastic Arab cavalry for an April release - so all being well I guess that'll be in time for Salute then. Not a surprise I guess, given their previous release, but great news. The good lady encouraged us to drop in on this show whilst visiting York. Which is a nice thing to offer to do; especially as for many a woman, wargaming is something to be tolerated at best. Anyhoo, it's not a show I attend regularly, being that bit too far from home to justify normally. But, not having been for five or so years I felt it was worth a try. The organisers are very generous in recognising that partners are not always there of their own volition, and so my lady got in for free. This may be commonplace, but at the few shows I go to I've not noticed it before, generally as I don't take a partner (they suffer enough!). This and the airy venue at York racecourse are two positives about the show. Nevertheless, once through the door it was the usually sweaty rugby scrum of too many people and traders squashed in to too little space. Personally I felt that more so than some other shows the games were rather lost in all this, easily overlooked or too crammed out to appreciate. We did arrive at the peak time granted, but it felt like many of the display games were trapped in main thoroughfares or tucked away in dingy corners. For me the traders could have been spread out better, but I'm sure the organisers did what they could. Only on the second floor by the track-viewing windows did space and lighting for the games seem fine. 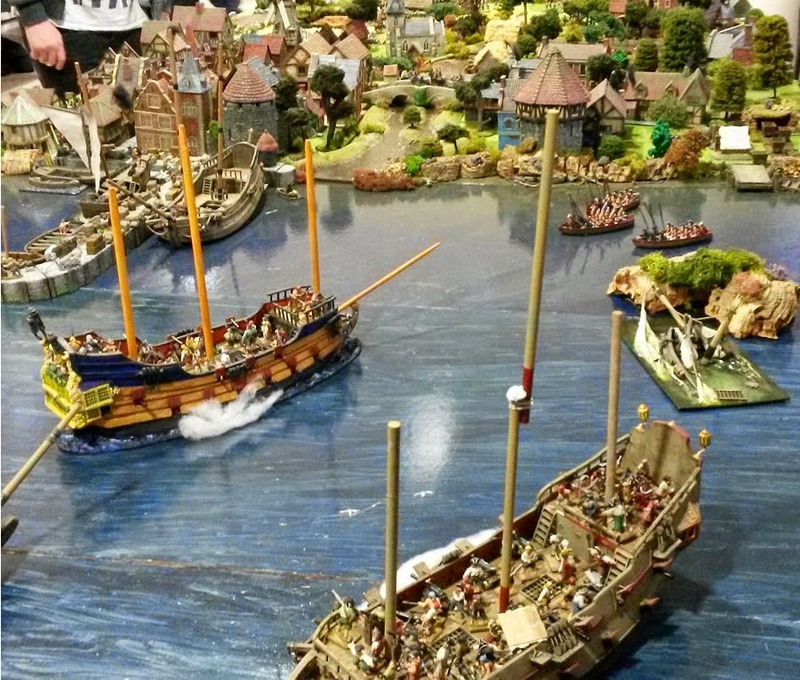 That in mind I found some of the displays very familiar, indeed from reading other accounts it appears at least one of them appears every year in much the same guise - like a model railway set. Some of the displays were of no interest, small or hey-ho humdrum. Also I only took my mobile phone so my photos are only a sample of the day. Knowing the day before I was to visit I had only a brief time to think if I needed to buy anything, in the end I spent half the £100 budget I gave myself - some plastic Napoleonics and a Metal Renaissance cannon being the entirety of it. I had hoped to find some books; but I managed to miss the book sellers in the melee. Given I was there for less than 2 hours, with company to entertain too, it's no surprise. So I had an OK time, I'm glad I don't turn up for this one religiously, given the faff involved, but it is a perfectly acceptable show. We rounded off the day with a walk round the walls of York castle, the Shambles and a nice Italian meal. 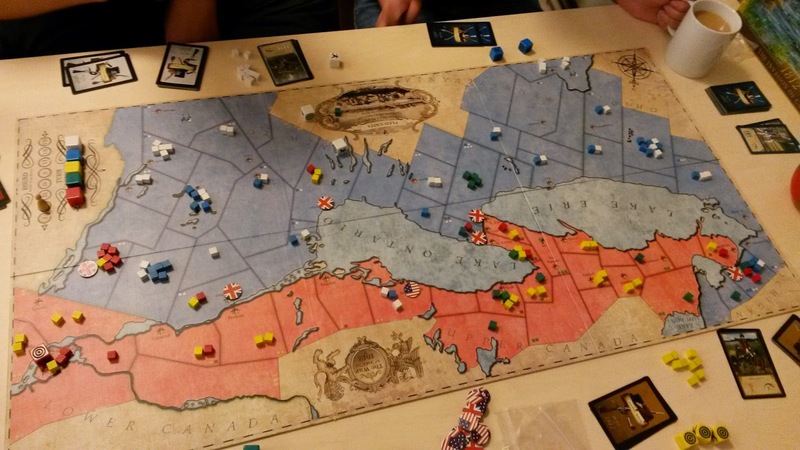 A couple of weeks ago I got my fist opportunity to play one of my holiday presents to myself; 1812: The Invasion of Canada. A simple (though not simplistic) board wargame reflecting events of this oft overlooked war. 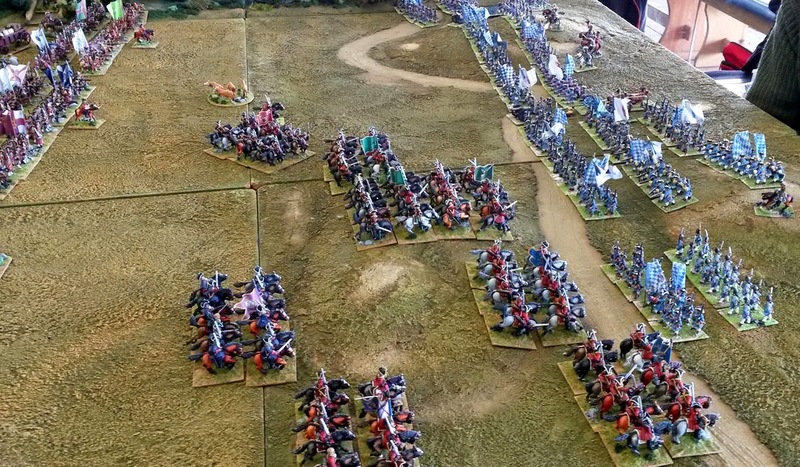 Now grognards may favour a game dependent on tables of data, march rates, supply concerns and accurate representation of historical units; to somehow fully convey the experience of the war in a play time only marginally shorter than the actual war itself. But '1812' does not go down that route and instead condenses part of the conflict (most would argue the key part of the land conflict) into a game with plenty of strategy that takes under two hours to play. 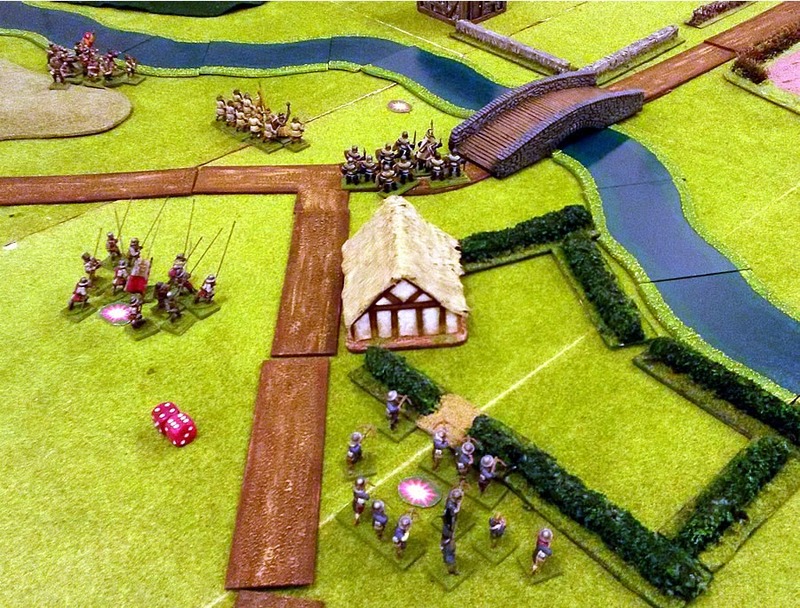 Ideally for either two players or teams of two and three respectively (the game therefore plays 2-5) the aim is to occupy the largest number of enemy objectives - towns and border fortresses - by the end of the game. This simple process is complicated by a number of elegant factors, first off being the order cards. Each player has a deck of 12 cards specific to their force (American Regulars or Militia, British Regulars, Canadian Militia and Native Peoples) 7 of which are basic movement, 4 being special abilities and one Truce card. In each turn you must play a movement card, of which the truce card is also one; but if the last truce card for your side is played the game will end once each player has had their turn. Now in our first play this worked great for the British team, as our truce cards came into our hands early and we were able to invade American soil and shut down the war before the US could recover. But the luck could've gone either way, and the element of first uncertainty and then anticipation of the war ending means sides are discouraged from hunkering down for the long game. It appears that the Americans are more mobile, but then the design of the board requires that. The fact that American armies could mobilise and move great distances constantly surprised us in play. Next to mention is the random activation, a simply engineered bag draw system; only on the first turn is it at all fixed - When the Regular American player goes first. Battle is simple with each side rolling a small number of D6 over as many rounds as required; but the dice are another elegant factor in the rules. Each has a number of blank sides and a couple of symbols (or in the case of the British dice, just one). 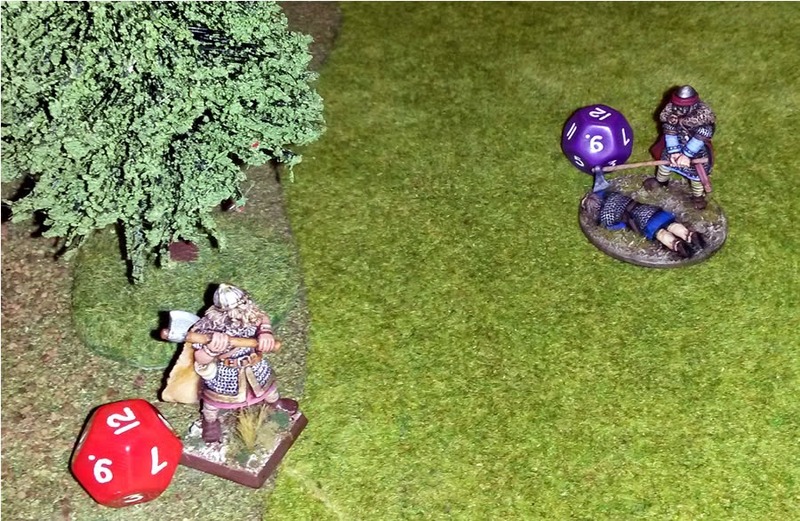 When the dice are rolled a 'Target' result is a hit on the enemy - and he must removed a block; a 'Running man' is a flee result and one of your units is removed to a rallying area - to muster on a later turn. A blank result allows you to retire a unit to an adjacent area, if you wish to - or you may stay in the battle. Each player's dice have different ratios of the symbols, with the British never fleeing and the Militia running all too readily. This gives a nice reflection of different units without the need for stats and tables. At the end of the turn players check to see if the game ends (essentially if all of one sides truce cards have been played), and if not place their markers in the draw bag and begin again. Reinforcements come in the form of set numbers of new units at set locales, and the return of any fled units. Americans have a slight advantage in recruitment and the longer the game lasts the more likely this is to play in to their hands. 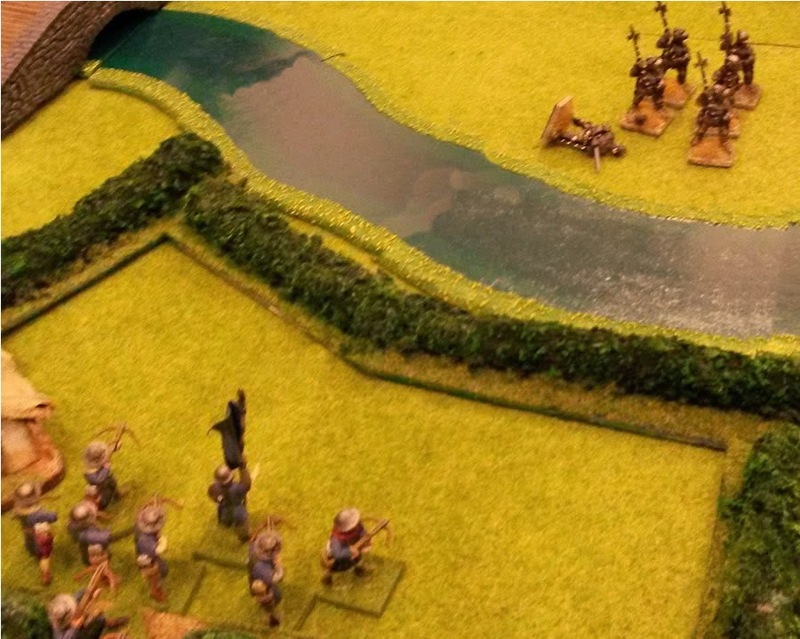 Further, the native peoples break a couple of core rules reflecting their lack of respect for borders and mastery of terrain; this they pay for by being easily the smallest force in the game. All in all I think it makes for a very elegant strategic wargame, one that would work well for two players going head to head, but results in a worthwhile amount of negotiation in team play. As I said we romped to a British victory in our first try (effectively taking all of the great lakes region into our power) and so I look forward to trying the American role next time. I think one of the beauty's of the game is that all you need to understand to play can be learnt in about 15 minutes, and it is not so mired in nitty gritty detail that anyone will feel or choose to be excluded from play. It is a nuance, elegant game with plenty of decisions built in to a simple system. A final point is that the production values are faultless, with quality components throughout; though this does come at an attendant cost, typically retail price is about £45. But if you enjoy a board game now and then, and want an insight into the period, this is as good a way to go as any. 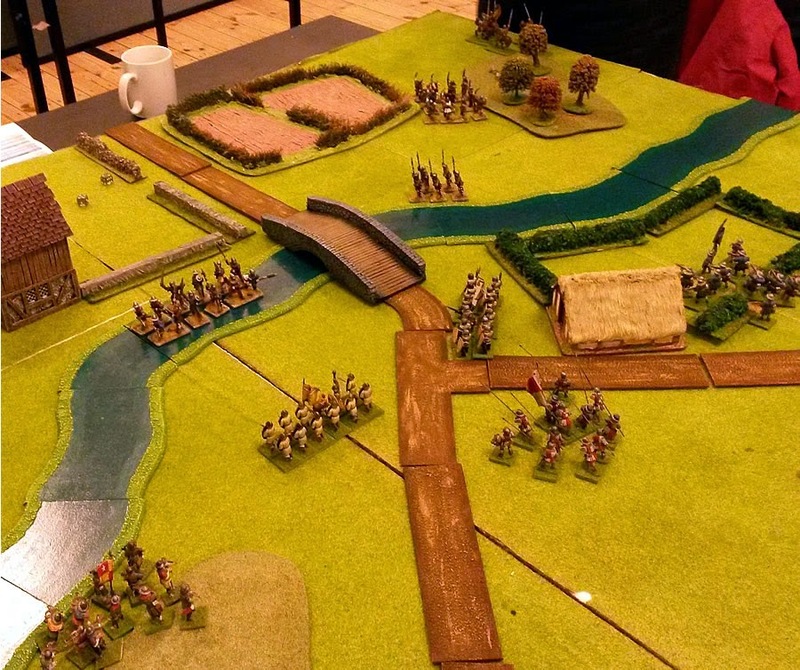 Postscript: Had a second chance to play this t'other night, and we managed to reverse the result with the Americans scraping a narrow victory. As I theorised, a longer game favours the US ability to mobilise troops. Really do enjoy this game. Finally completed after about five months on the side of the 'painting table'. She's roughly equivalent to a 54mm Model, standing some fourteen feet tall in 28mm standards. The hardest part was undoubtedly the flesh tones, such large expanses required more subtlety than my normal technique offered. Although I stuck to layering, I think there are about six or seven layers to the skin tone rather than the usual three. The cloth and armour were similarly styled whilst the base, club and hair all favoured overbrushing and drybrushing techniques; though again with more graduation of colour than normal. Overall for all the time taken I remain pleased with the result. And unless you pick up the model, no-one would ever realise this is is a plastic figure. I think I've now painted about thirty of my Reaper Bones collection and can only say each one is a treat.